Seribu Islands Transportation Sub-dept. is re-continuing the project of deepening sea water grooves and port basin on east side of Pramuka Island, Panggang Island Urban Village. It is targeted to be completed in two months.
" The project is continued again, with a maximum work plan about two months. 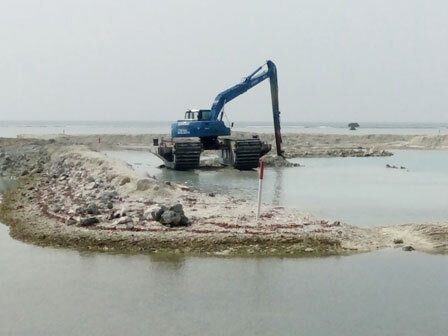 Two units of excavators have started to deepen and widen the water grooves"
Suherman, Section Head of Facility and Infrastructure for Seribu Islands Transportation Sub-dept., the water grooves will be deepened from 16x400 square meter becomes 50x400 square meter. Likewise with its width, will be deepened from 30x60 square meter becomes 100x100 square meter. "The project is continued again, with a maximum work plan about two months. Two units of excavators have started to deepen and widen the water grooves," he expressed, Monday (8/14). He explained that it was previously stopped, because of as limited fund for subsidized fuel (BBM). Through the project, it is hoped able to support tourism sector on Pramuka Island. "Apart from being used as ship berths, we will also build an artificial beach and a waiting room in future," he closed.